Lynne has decided to join them, I will stay here in Basecamp to prepare our next trip up to the sides of mighty Everest. As an aid to understanding our terminology-filled professional updates, we have decided to explain some of the most commonly used terms about climbing Everest. ABC: a place Above BaseCamp, any place will do, so one meter should be enough to say you have reached ABC. Acclimatisation: getting used to headaches, lack of appetite and bad smells. Balcony (the): nice viewpoint where many bottles are being emptied. Basecamp: place to sleep near mountain but still far from any real climbing. Resort with abundant luxury. Base-Camp: wearing old fashioned clothes and acting like Reinhold messner, with suitable beard. zombies with no interest in climbing whatsoever. Crevasse: fancy french name for huge crack in ice, usually covered with snow for entertainment purposes. Mostly succesfully crossed by use of ladders or ignorance. Crampon: tool to slice expensive clothing, mostly worn on feet. Name comes from the cramp you get in your shoulders when you put them on. Down suit: Wearable sleeping bag, filled with goosehair. Unlike the name suggests mostly used when going up. FBC: Fat Bastards Club. Collection of western climbers eating more than they climb. HAFE: High Altitude Flatulation Exhaustion. Getting sick of fellow climbers smelling and sounding terribly bad. HAFood: Short for High Altitude food. Weirdly enough you will eat this stuff -which you would not touch with a 6ft pole at sea level- at the moment that your appetite is at an all time low and you do not digest anything anyway. Also used to fix stone walls around tents. Jumar: gravity fighting device that ruins ropes (see 'Ropes') and supplies interesting movements when frozen. Has taken over from ice-axe (see 'Ice-axe') as leading metal item used for climbing. Female Bollywood climbers doing the shoulder-shake use them in full effect when used in pairs. Ice-axe: Old fashioned tool used to hit ice and snow for interesting sounds ('Thud', 'tsjak'). One sharp end for killing Yeti's (see 'Yeti'), one scoop end for ruining down suits (see 'Down Suits'). Now replaced with Jumar (see 'Jumar'). Mostly used for summit pictures only, on Everest. Mushroom rock: very wrong music, some people are allergic to it. Oxygen: substance that makes iron burn. Sold in bottles for home experiments. RBGAN: Right Before Going, Another Newsletter. Rope(s): long thin items to tie climbers to mountains. Mutual attraction with crampons (see 'crampon'). Satphone: short for Satellite phone, also known as EWUC, Electrical Wireless Umbilical Cord, for 24/7 contact with homefront. Sherpa: climbing instructor and professional without matching ego and salary. Useful for helping realize dreams without having to give credit. Yeti: Career killer for Tirolean mountaineers. Lives in cave just past middle camp on Tibet side. who of the three is not Nepalese? Was great speaking to you earlier today Lynne........glad to hear Noel is going for professional advice at hospital, and that his vision is slightly improved on what it was. Geez guys awful new about Noels eyes - hope the hospital trip sorts him out. No truth in the rumour that Lynne popped something in his drink when he spent too much time admiring the female indian climbers??!!!! Lynne and Noel good luck for the trip to the hospital tomorrow. Have a safe journey and hope to hear good news from you soon. All our love ann and the girls. Great use of your time at BC Harry, I love the new Everest dictionary! I am sure I will be referring to it. Please let Alex know that his reports are being read also. It is nice to have the "variety" of information from you, Alex and Lorenzo. Thank you! A special "good luck" to my brother, John. No only joking! The chiselled good looks of a Dutchman (Harry) belongs to the one on the left - unless Harry, you claim Nepali citizenship as well!! I saw the "RBGAN" in an earlier post and wondered what it mean't - now I know, so your dictionary has proved useful as well!!! Best wishes to the Norn Ireland folks. Noel, I really hope it goes well at hospital for you mate. Well done to Lynne for supporting her man and going with him. Take care folks and I wish you both the best of health and here's hoping you will return to Harry's gang!! Hope you are well Lorenzo and the excessive oxygen at BC has eased your heavy breathing. I'm sure it will be a bit easier for you in phase 2 of acclimatisation. Best wishes and take care up there. I always check your site at around 6pm here at the end of my working day in Queen's University Belfast - to see if another excellent audio blog has been posted. Your technology is holding up well - excellent quality of sound. My Italian colleague has also listened to your posts - both the English and Italian language versions. I must learn some Italian soon. As with most of the dictionary Harry was joking about RBGAN. What it actually means is Regional Broadcast Global Area Network. It's kind of a superfast satellitephone for data-transfers. Below is a picture of one... Just so that you don't think Harry was serious about what RBGAN meant! Lynne and Noel good news from your email.i'm glad things are working out for Noel and he's even letting you type Lynne. Noel's photo in the tent looks as if he is phoning the other members of U2. just think he could be leading a double life! Thanks also to Harry for the crash course in mountaineering terminology.at least i feel i can keep up with the lingo. Will keep listening to Lorenzo as his reports are so visual it brings the atmosphere a little closer for us armchair people. Thanks for the technology lesson. I thought the RBGAN was just a made up acronym by Harry. I had no idea that it was real and represented a piece of equipment which makes use of the communications satellites. Well just goes to prove that you learn something new every day!!! I'm sure Harry's having a good laugh now - he fooled me on that one!!! Great website and worth a visit if you are eager to learn more about communication when you are "far away". A BGAN (or RBGAN which is regional) is a high-speed data terminal that uses one of the sat comms systems. They are available for at least both Iridium and Thuraya and can transmit data (only) a lot faster than a sat phone. Lorenzo and Scot Wollums had one with their team when Lorenzo did Lhotse in 2003, and it stayed in base camp together with laptops and a couple of team members. All the news teams use them, eg: in Iraq. You can rent them too. John -- Miss you ... Be safe or I'll kill you! Mary Clare -- Your song sounds like it's coming along nicely. Is it possible to post a sample of it on this website? Harry -- Love your irreverant sense of humor! HAFE is my personal favorite. Noel -- Hope your eyes are improving enough to continue the expedition. 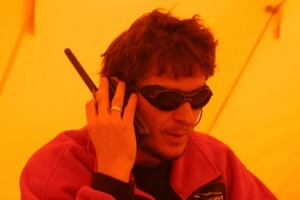 Thanks for letting John use your satellite phone. Lorenzo -- Still waiting to see a picture of your Mick Jagger impersonation. Thanks for the informative blogs. Looking forward to more posts and blogs in the hopefully near future.